The gold diggers over at Eurobricks have struck brick in them there hills, having found high-res images of The Lone Ranger theme. First hinted at here and rumoured here, the new theme has been eagerly anticipated by fans of LEGO Western. With high-res images now available, it seems time to ask how this theme has shaped up – and wonder where all of the large barrel pieces have gone! With six main sets (that is, excluding any polybags or exclusives that turn up), this is clearly another tight, one-year kind of theme. Pirates of the Caribbean managed more sets, but that was thanks to having three existing movies to utilise. This is more like the offering made for Prince of Persia, which was in the same position of being a new-to-modern-movie-audiences franchise (not that it became much of a franchise in the end). What brings this theme closer to Pirates of the Caribbean, and gives it a head start over Prince of Persia, is that it is essentially a licensed version of a much loved, much collected and fondly remembered LEGO theme. 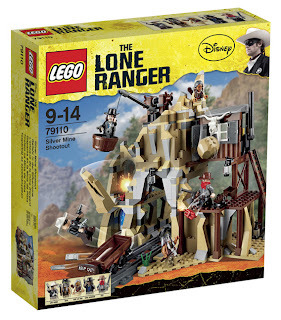 So as well as the potential parents and children who may love the movie and buy the toys, there are plenty of AFOLs who just want some LEGO set in the Wild West. The Cavalry Builder Set (79106) is a nice small set, as it provides adult fans who want a nice big cavalry the chance to army-build. It would mean ending up with a bunch of spare Lone Rangers, but that would be worth it since there’s an extra horse and cannon in there – and who couldn’t use more of those? If AFOLs want to add the soldiers to their classic Western sets, they wear white gloves so it is just a case of switching the fleshie head for a yellow one- nice! It also makes for a good entry, birthday present size set for children. 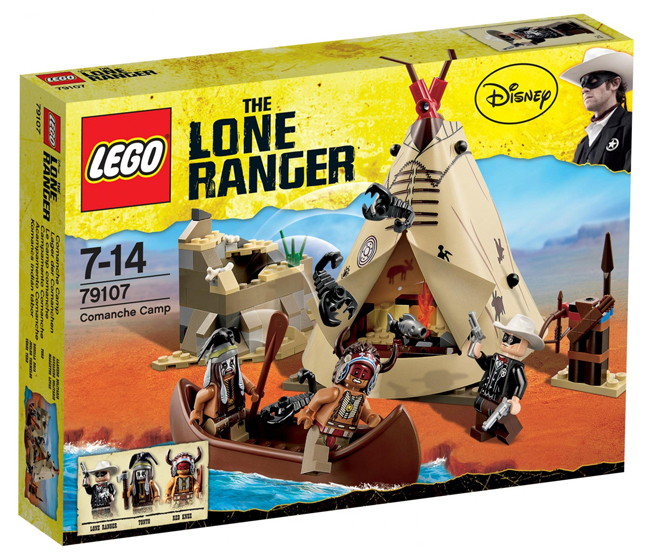 It’s a shame to see a plastic rather than felt tepee in the Comanche Camp (79107), but at least it will be more durable. On the positive side, more classic accessories make an appearance rather than being redesigned for the sake of it (Collectable Minifigures, anyone?) and a smattering of scorpions is good. It would be expected that there should be quite a bit more building in this than the Cavalry Builder, but unfortunately it looks a little on the light side as far as that goes. 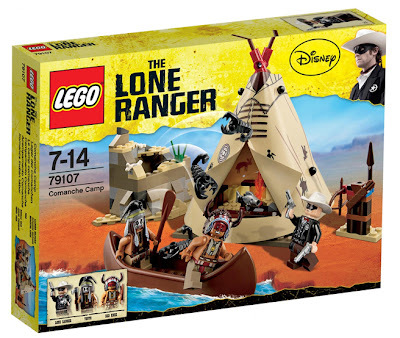 This theme is a good example overall of how a few less mini-figures, a few less animals, might increase the piece counts and make for better LEGO building sets. 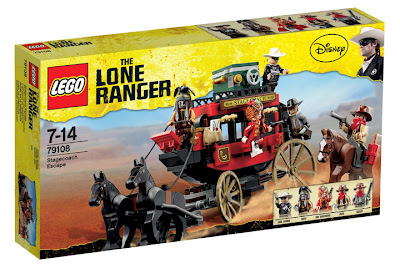 Stagecoach Escape (79108) is a great looking set, and unlike any previously released LEGO Western vehicle. This looks to have a quality build as well as nice roster of mini-figures and horses. It also has a nice mix of classic elements (the guns, the scarves) and new-to-Western elements (the dynamite back in the nineties was printed on a tile, since then it has been introduced as a moulded piece). 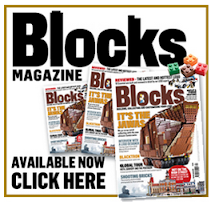 Even if a LEGO fan was not going to collect the whole theme, this would be one worth picking up. The Colby City Showdown (79109), much like movie sets from old Westerns, is little more than a façade of a town. Bits of it can be ‘blown up’ (even without the classic dynamite tile! ), and the fronts of the buildings look reasonable. This is about what is to be expected of buildings in modern LEGO sets, but it does not live up to Gold City Junction (6765). 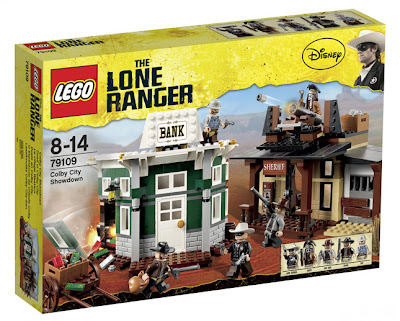 This is more of a general issue with the way LEGO does buildings now (with the exception of AFOL-targeted exclusives), so as long as fans know that it isn’t 1996 anymore, this set shouldn’t be a disappointment. Things are getting decidedly bigger in the Silver Mine Shootout (79910), which does include some large rocky pieces but also plenty of smaller bricks too. This means hopefully a more interesting build but also a nicer looking finished set. There are multiple play features hidden in there, and this set needs them – otherwise it is just a big hunk of rock with some railway track underneath it! This definitely feels like a set that needs the others around it to make it feel part of something. 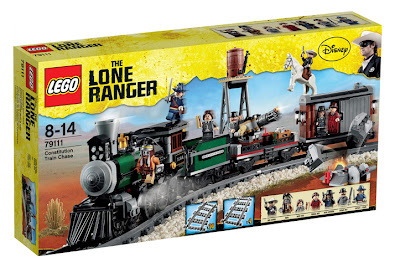 Things are rounded off with a great large set, the Constitution Train Chase (79111). Unlike most train sets in non-City lines, this one comes with track! Twenty pieces no less! The train itself is nicely designed, and like the Stagecoach Escape really looks the part. It is a shame there are not a couple of more substantial carriages (although maybe this is exactly how it is in the movie), but at least there is a large barrel – for fans of the classic line who were worried that it might not turn up. The only other issue is where there is room for the Power Functions to make it move – but no doubt some train sort of people will figure out the solution quickly. This is a great set to be ‘the big one’ in the theme, as it adds even more variety to what is a genuinely diverse range of sets. 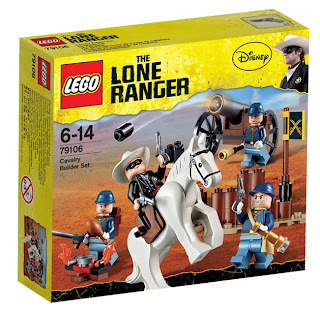 Overall, The Lone Ranger looks to be a nice theme to collect. Only six sets, price points spread out, all quite different and well designed. 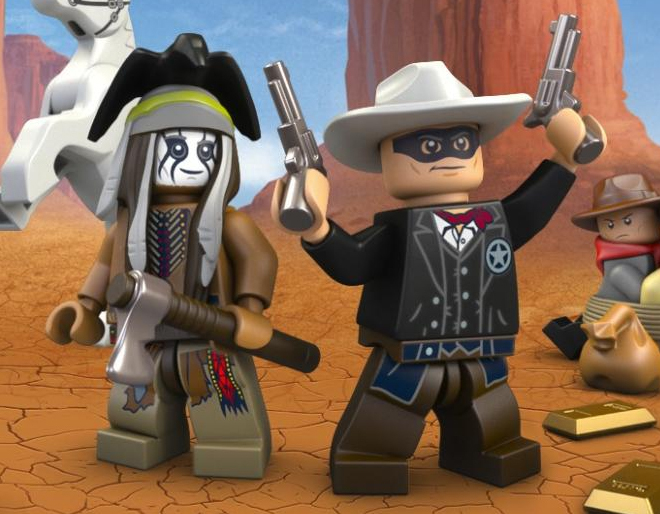 It really feels like the designers put a lot into this, presumably aware of how high anticipation would be for the return of something close to LEGO Western. 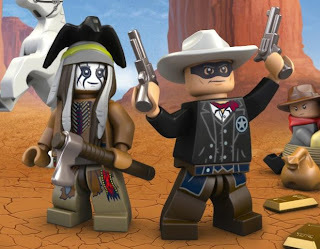 Let’s hope that if this theme performs well (which will probably depend on the movie performing well – unlike Prince of Persia) someone at LEGO decides to do more Western, although back with yellow faces.